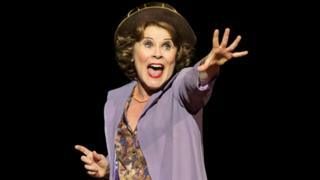 Actress Imelda Staunton has been honoured at an award ceremony for the best theatre created outside London. Staunton won the UK Theatre Award for best performance in a musical for her role in the Chichester Festival Theatre's production of Gypsy. Written in the 1950s with lyrics by Stephen Sondheim, Gypsy opened in Chichester a year ago and has since transferred to London's West End. The show was also named best musical production at Sunday's ceremony. Dame Eileen Atkins and choreographer Matthew Bourne received outstanding contribution awards, while Polly Lister and Joel MacCormack shared the trophy for best performance in a play. Staunton was not present to pick up her award because she was saving her voice on her day off, according to Chichester artistic director Jonathan Church. "She is, as part of her regime, lying down every Sunday," he said. Accepting the award on her behalf, he said: "UK Theatre embraces the whole range of theatres she feels passionately she created some of her finest performances in. "And of course the subsidy that enables those theatres to exist is important to her - she wanted that message to be heard." Staunton plays Momma Rose in Gypsy, which transferred to London's Savoy Theatre in April and runs until the end of November. Dame Eileen Atkins, who co-created TV dramas including Upstairs, Downstairs and The House of Eliott, said the Shakespeare Guild's Gielgud Award meant "an enormous amount". She was presented with the trophy by Sir Patrick Stewart. Other presenters at the ceremony at London's Guildhall included actors Robert Powell, Barbara Windsor, Richard Wilson and Pauline McLynn, who received one of the afternoon's biggest cheers for rounding on "London-centric critics". Matthew Bourne said receiving The Stage Award for Outstanding Contribution to British Theatre was "very significant to me" because it was a theatre award and not just for dance. "I've had dance awards before now, if I've had anything, and I'm always thinking that dance is theatre," he said. The best new play prize went to Iphigenia In Splott, staged by Sherman Cymru and set in the Cardiff area of Splott. Its writer, Gary Own, described it as the story of "what happens to an ordinary woman in austerity Britain". He said theatre, and not TV, was now portraying those struggling to make ends meet. "In the '80s but I remember on TV there being things like The Boys From The Blackstuff - these really fierce dramas portrayals of how difficult life was becoming for ordinary people," he said. "When this recession started, we expected the big beasts of British drama to show what was happening to people. And it hasn't happened at all. So thank God theatre is still there to shout about what is happening." Newcastle Theatre Royal was named the country's most welcoming theatre - following a similar accolade for its backstage team at the Technical Theatre Awards. The UK Theatre Awards do not cover National Theatre productions or West End shows unless they have transferred from a theatre outside the capital.